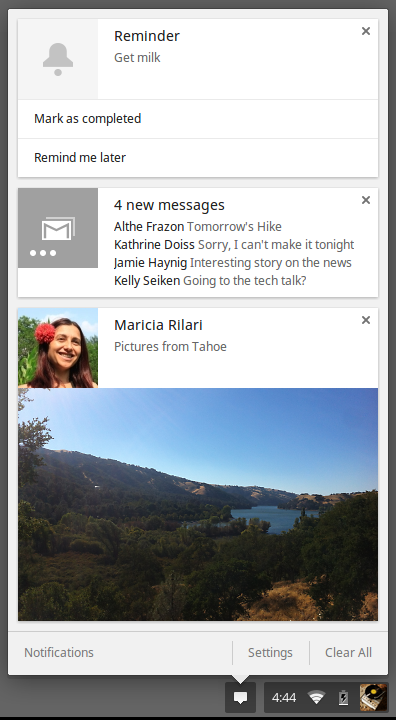 and extensions can enable users to act directly on these notifications and show rich content like lists and images. For those in beta channel, notifications now live in a center that is outside the browser, which allows them to receive notifications even when the browser is not open. Rich notifications are available in the latest beta channel builds on Windows, dev channel builds on ChromeOS, and will be coming to Mac OS X and Linux soon. 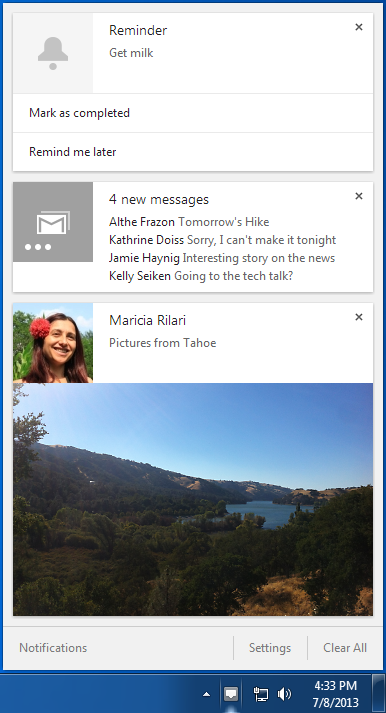 Rich notifications include full-bleed icons and space to convey a headline and short message. Additionally, they enable you to create action buttons and respond to clicks right within your app, empowering your users to do anything they could do within the app’s UI itself. 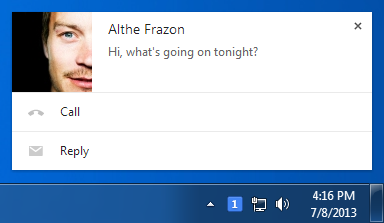 The notification center holds all current notifications and can be pulled up at any time from the launcher on ChromeOS or the system tray on Windows. Users can view and clear all of their notifications in the center, and also access settings to control which apps, extensions and websites can send them notifications. App notifications send immediate alerts to users about important events as they happen. Chrome and Chrome OS already support basic web notifications, but rich notifications for Chrome packaged apps and extensions can enable users to act directly on these notifications and show rich content like lists and images. For those in beta channel, notifications now live in a center that is outside the browser, which allows them to receive notifications even when the browser is not open. Rich notifications are available in the latest beta channel builds on Windows, dev channel builds on ChromeOS, and will be coming to Mac OS X and Linux soon. release introduces several new developer features and a major under-the-hood performance improvement. Unless otherwise noted, changes apply to desktop versions of Chrome and Chrome for Android. We’ll be rolling out the update over the next few hours. 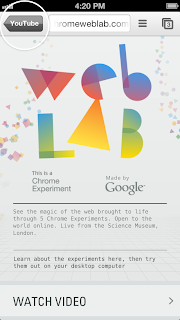 In today's Beta, Web Audio joins WebGL and WebRTC as an option in about:flags in Chrome for Android. Used together or independently, these three features will allow you to create rich, powerful web experiences that work across device form factors. We’re still actively improving the implementations, but we invite you to start experimenting. To see them in action, watch the mobile web demo in the Google I/O 2013 keynote. The prefixed version of the Content Security Policy HTTP header is now deprecated, so please use Content-Security-Policy instead of X-WebKit-CSP. The prefixed version will still work for now, but future releases may not support it. For Chrome Extensions, HTML-based notifications have been deprecated in favor of the new Rich Notifications Chrome API. Extensions developers who are using HTML notifications in their apps or extensions should migrate to the newer Rich Notifications API, as support for the existing createHTMLNotification() feature will stop working in a future release of Chrome. You can now use CSS @supports conditional blocks to test whether Chromium supports certain property:value pairs. The :unresolved CSS pseudoclass lets you style a Custom Element that hasn’t been registered in the browser yet. Custom Elements are part of Web Components. 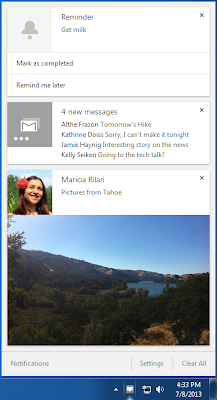 Chrome Apps and Extensions developers can now use rich notifications to proactively engage with users. For general information about what’s going on in Chromium and Blink, watch the recordings of the fireside chats with the Blink team and the Chrome team at Google I/O 2013. Today’s Beta channel release introduces several new developer features and a major under-the-hood performance improvement. Unless otherwise noted, changes apply to desktop versions of Chrome and Chrome for Android. We’ll be rolling out the update over the next few hours. 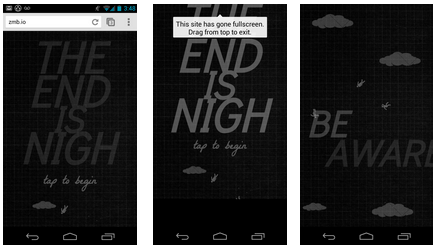 , users can open a web page in Chrome and then return to your app with just one tap. In the example below, a YouTube user has opened a link in Chrome. “YouTube” is prominently displayed in Chrome’s back button. Touching “YouTube” returns the user to the YouTube app. After you've downloaded the OpenInChromeController class and added it to your project, you’ll be able to check if Chrome is installed, and if so, send links to Chrome with or without x-callback enabled. Additionally, you can specify whether or not to open a new tab when sending a link to Chrome. For a deeper dive and to download the code, check out our developer docs. As an iOS app developer, when your users want to access web content, you currently have two options: create your own in-app web browser frame, or send users away from your app to a browser. 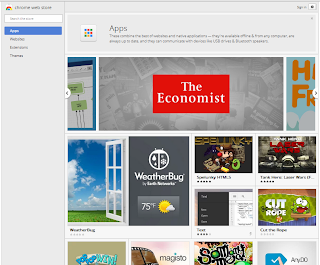 of Chrome packaged apps and the Chrome App Launcher. 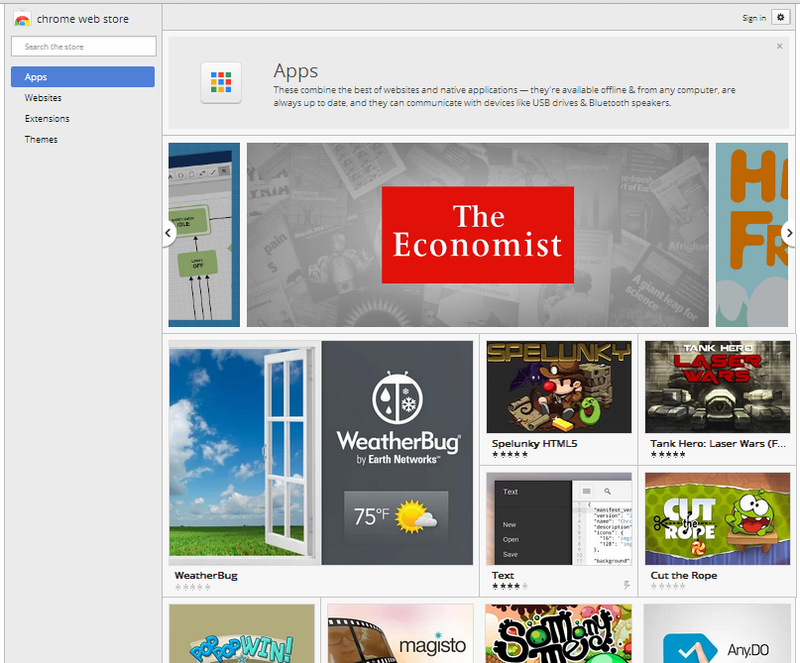 That preview enabled you to to upload your Chrome packaged apps to the Chrome Web Store and test the app install flow. However, a Chrome packaged app was discoverable only if you had a direct link to it, not via searching and browsing the store.